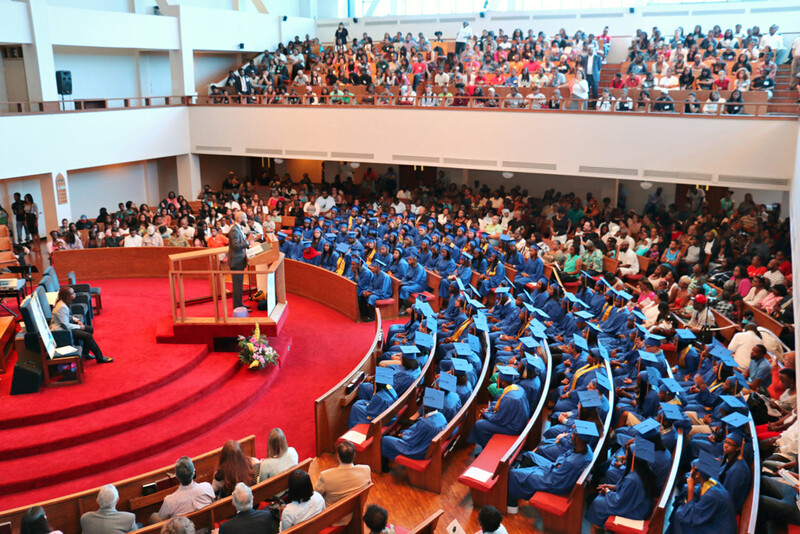 On August 29, 122 YouthBuild students graduated in front of friends and family at a ceremony held in Zion Baptist Church’s sanctuary on North Broad Street. Hundreds of guests attended, as well as Class of 2015 applicants currently going through Mental Toughness Training. We were honored to welcome Marcus Allen, CEO of Big Brothers Bi g Sisters SEPA (BBBSSEPA), as our keynote speaker this year. A strong proponent of service and mentoring, Mr. Allen thoughtfully included references to our students’ individual accomplishments as community leaders. Prior to joining BBBSSEPA, Mr. Allen was the CEO of ACHIEVEability, a non-profit that provides housing – which YouthBuild students help maintain. April Broaddus, Class of 2005, delivered a rousing alumni address encouraging graduates to be proud of their pathway through YouthBuild, and to recognize past setbacks as opportunities. Don’t think that just because you didn’t take the traditional path in your education that you can’t go as far as anyone else. At YouthBuild, our core values make us that much stronger! Don’t think it stops here. Don’t limit yourself because you’re afraid to compete or fail! People who stumble can still be incredibly successful. Michael Jordan lost many a game before the Bulls hit their winning streak! The Beatles, one of the greatest selling groups of all time, were turned down by a record company because they didn’t like the sound and style of their music. Walt Disney was fired from his job as a cartoon artist because they said he lacked creativity. J.K. Rowling, author of the Harry Potter series, was on welfare when she wrote some her best work to date! You’re gonna stumble. You’re gonna fall. You’re gonna have to work twice as hard as you did while you were here. But it’s worth it! This year’s student speakers were Perseverance Award Winner Tania Garcia, Valedictorian Jamal Johnson, and Salutatorian Carmen Williams. Today I am here standing not just for my accomplishments, but I am also standing with the rest of the YouthBuild student body that showed perseverance by taking back our education. My words to the Mental toughness applicants are, “Don’t Give Up!” I know that’s what everyone says, but really, Do Not Give Up. You will understand the importance of these words in a year when you graduate. A lot of people told me not to give up and it wasn’t always what I wanted to hear, but I’m so glad they reminded me every time they saw me. To the 2014 YouthBuild students: I hope that our friendships don’t end here. I also hope that we all remember this chapter of our lives as a great example of our ability to overcome. Living life along the “YouthBuild Way” has been an inspirational experience for me, as well as all my peers throughout this past year. I am reminded often of the hills, valleys and winding roads along the way that we faced individually and collectively, but here we are Class of 2014. We’re not completely at our destination, but we’re merely at a pit-stop. This pit-stop is for us to refuel and continue on to the path that has been destined for us. 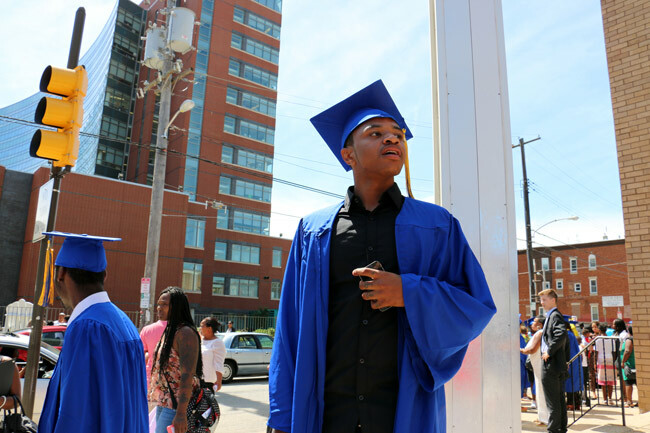 We have exemplified YouthBuild Philly’s core values of Respect, Excellence and Perseverance, not only academically, but socially. This year has been a an emotional roller coaster for me, but I have been willing to give up sleep and many other things to be able to finish my projects, essays, and other requirements to be here to graduate with you all today and I know many of you all have that same similar experiences as well. The importance to post-secondary endeavors has been instilled in us to transition to college or employment, because we want that high school diploma and vocational training. We want to be successful, self-sufficient young entrepreneurs. When I arrived at the Wingohocking Project, handed this unfamiliar yellow piece of plastic, I noticed I had two things in common with the house we were about to build: we were both broken and yet we both had the potential to be restored. This house and I were ridged materials, skeletons of who we had been designed to be left unoccupied, un-loved, and un-kempt. It was there, in that abandoned home, that I openly expressed pain for the first time. I never wanted to face reality. Reality meant my parents were never coming back from the grave and life would not cradle a lost cause. But it was in this place, in remnants of what was once a child’s bedroom, that I saw a reflection of who I wanted to become. The epiphany that we were a product of ourselves and not our environment was real and perhaps harsh. Our team had two options; we could allow life the satisfaction of completing its work of demolition or we could take control and reconstruct. For me, that meant giving up what I wanted; fast money, and false happiness for what I needed: Stability. Love. To know I had value. I had to remove the excess debris because building anything takes time, patience, and the removal of things that stand in your way. Today I stand before you wearing yet another hat — my graduation cap. Today is a day to celebrate but let’s also remember that we are all still works in progress, all of us. Which is why we still need our hard hats. I cannot condone the cliché speech that everything will be alright if you try. Class of 2014, we need one another. Life will continue to throw obstacles our way. Whether we’re physically together or not, we will continue to wake up each day and put on our tool belts, reconstructing lives one nail, stud, and door frame at a time. At the ceremony, we were pleased to award scholarships to twelve graduates, thanks to individuals who gave to the Class of 2014 Scholarship Fund. The Young Friends of YouthBuild Philly raised an entire scholarship at a bowling fundraiser last month, which went to De’Shaun Burton. Carmen Williams received the John Gallery Leadership Scholarship. The families of Steven Lawrence and Sean Bolden – former YouthBuild students who, sadly, passed away a few years ago – also raised funds for scholarships, which went to Jamal Johnson, Quadier Timms, and Malik Robinson. To see more photos from graduation, visit our Facebook photo album. NewsWorks and ABC6 also covered the event! 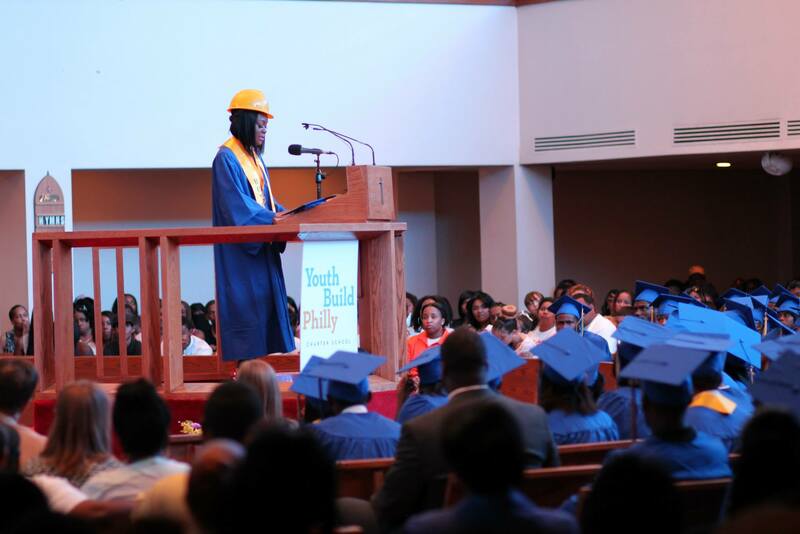 Although our alumni will be employed and enrolled with organizations outside of YouthBuild, we will continue to offer supports and programming (e.g., TransPasses and counseling) that officially constitute a “Year 2” of our program while our graduates adjust to postsecondary education and employment. This year of continued support will help them transition fully and smoothly into colleges and careers to achieve long-term success. So don’t worry, you’ll still be hearing from the Class of 2014 as they embark on their next steps over the course of Year 2! Stay tuned for success stories and updates.